In heathland pine forests heather is starting to flower. A late summer mood somehow, but the plants have developed fast this year and they are some weeks ahead of their ordinary time. The dwarf shrub of heather is up to 60 centimetres high, with a densely branched stem, very small leaves set in four rows and covering each other like roof shingles. This shows the adaption of the species to dry conditions: from the tiny leaves a minimum of water evaporates even in drought periods. The tiny pinkish purple flowers are set in a dense, one-sided inflorescence. Looking at its habitats heather seems to be a very tolerant shrub, it grows where few other plants can manage. Actually the light-loving heather needs much sun and can crowd out other plants from habitats that suit it. In more shadowy locations the situation is the opposite, others crowd heather out. 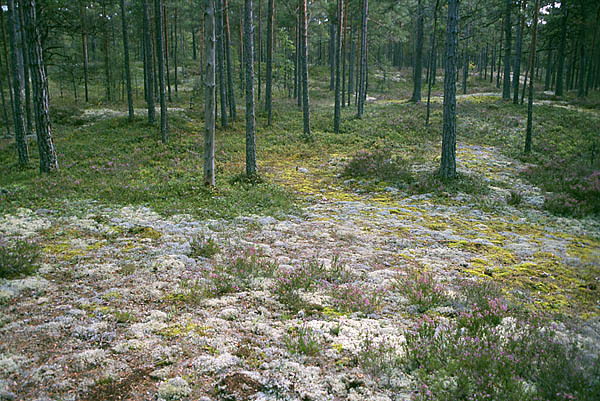 The plants prefer acidic soil such as the ground in pine forests and in bogs. It is known and recognised by all as a valuable honey plant – the flavour of the honey is somewhat bitter and from the honeycombs heather honey can only be pressed out.